Trailblazers—the 14% of survey respondents who are far ahead of others in their path to value in the cloud—recognize the benefits of the cloud and are using it to drive innovation strategy, and they’re far ahead in moving business functions to the cloud. All of our leaders are either partially or fully functional in the cloud, with the engineering/development and operations functions seeing near-universal adoption. Q17. To what extent do the following business functions operate using cloud-based services now? (Top 2-box score) Click to enlarge Not only are Trailblazers ahead in migrating business functions to the cloud, they also are seeing clear benefits from cloud adoption. Next week we’ll take a look at the specific advantages Trailblazers are seeing from their cloud adoption strategies. 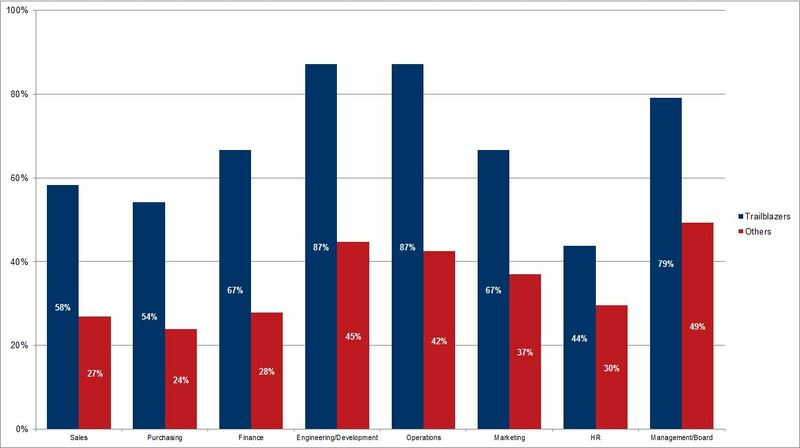 About a third of our 350 respondents say that core business functions (e.g. payroll, billing, and workforce planning) have a substantial presence in the cloud today. And as you can see in the chart below, these companies expect robust growth in these areas over the next two years. (Click to enlarge) Respondents from government/education expect to be significantly ahead when it comes to workforce planning—two thirds of those firms expect that function to be in the cloud by then. While we’ve seen that more profitable firms generally tend to have more sophisticated cloud understanding and capabilities, the gap is not as wide when it comes to these core business functions. Meanwhile, smaller companies—those with revenues less than $99 million– expect to be significantly behind other firms in terms of migration of key business functions to the cloud.